In the time I stood on the porch, never leaving the steps, the clouds moved and changed, the sun rose as the lighting morphed within minutes. Golden tones turned yellow, spilling flowers turned their rose tones to silhouettes, and when the sun broke through, the flowers became translucent. With this camera, I was blinded by the sun as I tried to capture what I could see. This is simply gorgeous, Louise! I love you/the tale . It`s nearly a beautiful short novel , very romantic. 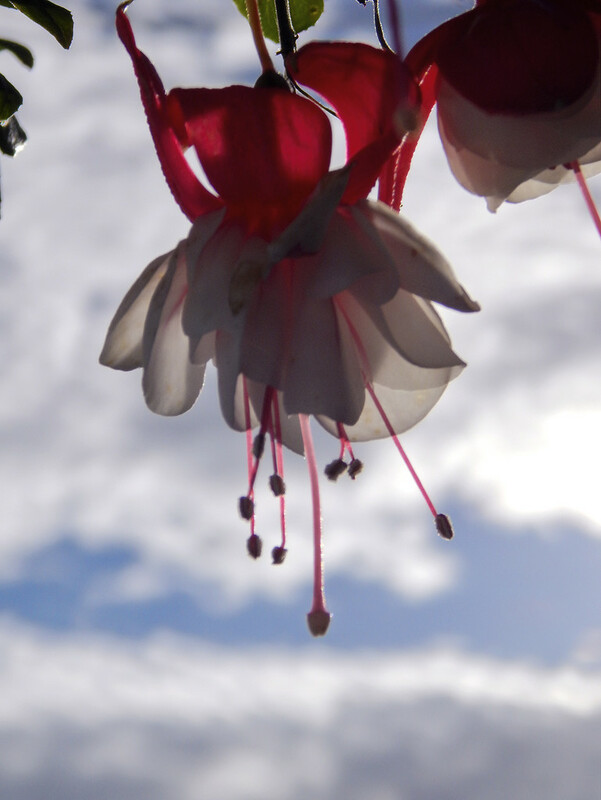 And a lovely Fuchsia flower pic. to it. Pretty POV! I like the light. so very pretty! Love fuchsias! Lovely delicate shot. Very clever Louise. What a delightful morning experience you enjoyed. Sounds to me like living in Nova Scotia is a magical experience. Your picture hints at the wonders of the beauty there. Oh, Louise! What magnificent images you conjure with your words! And your shot really encapsulates the whole! Fabulous! well done. Wish I was up there. It is one of my favorite places in the whole world I've visited. Super flower and sky shot. you are quite the poetic, aren't you? you commend me with my writing when you yourself have a good command of words! i love it!